My cousin shared this story; tell me if it sounds familiar to any of you. She bought a Christmas stocking for her little girl. All is well. Time passed, and she had a little boy. She went back to the same store, and, hurray, they still carried those same Christmas stockings. 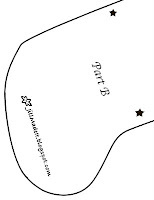 BUT--when she got home, she realized that the two stockings were not, in fact, the same; they were different sizes. Now, a baby's isn't going to know or care that his stocking is smaller than his big sister's, but one day, he will. How can you have all your Christmas stockings match without buying a whole new set when each new baby comes? Even if you make the stockings, how do you know the fabric you chose will still be available next time? Answer: variations on a theme. All the stockings were made from the same pattern, but in different fabrics: variations on a theme. So it doesn't matter if I can't find, for example, the candy cane striped fabric again--I will just pick a new set of fabrics when we add another baby to our family. 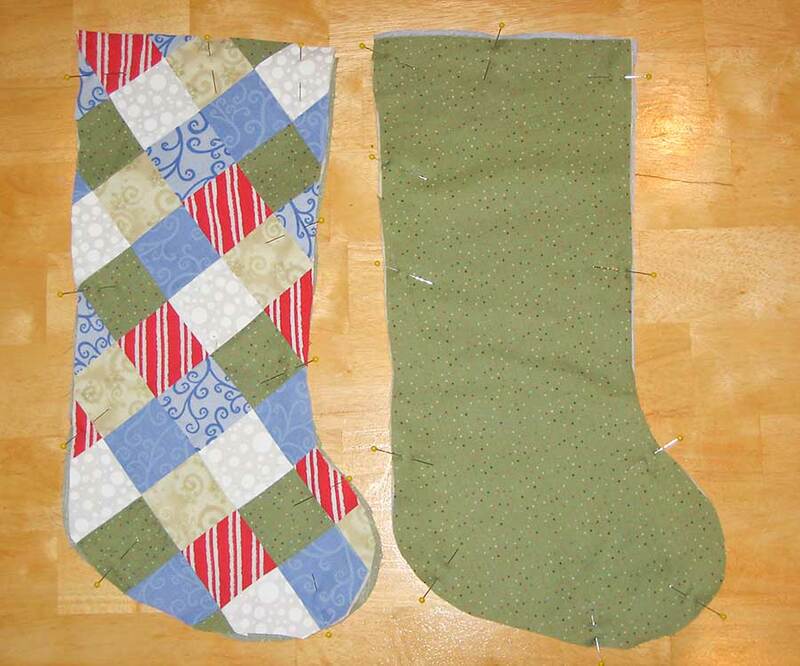 Would you like to make your family some new Christmas stockings, too? -----If you are buying new fabric, I estimate that you will need a bit less than 1/2 yd total, so if you got 1/8 yd of four different prints, you'd be good to go. But you could make this out of however many different fabrics you'd like. Approximately 60" of bias tape, or fabric to make your own (For this project, it really should be cut on the bias, to help in going around the curves.) See this tutorial if you need some help making bias tape. First, cut out the fabric for the linings and backing, as well as the batting. They're all the same; might as well get them all done at once. 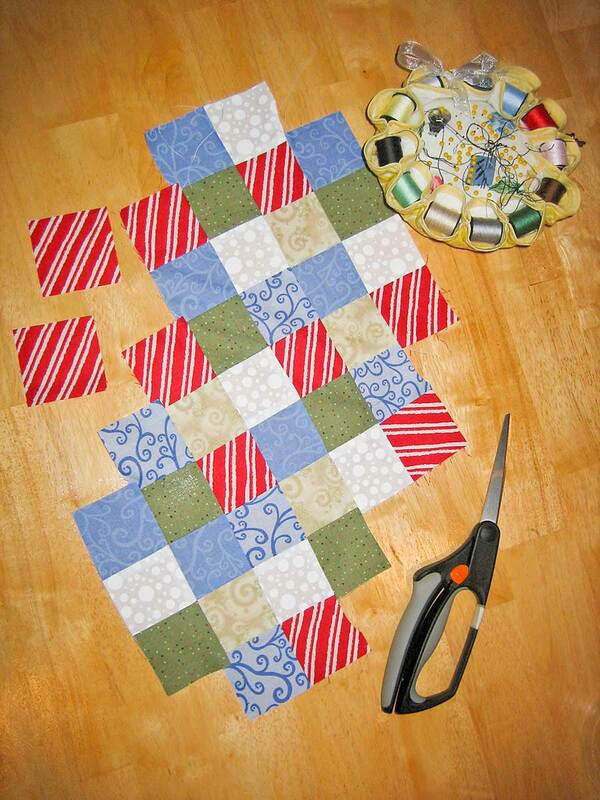 Next, lay out your 2 1/2" squares into a nice pattern, or lack thereof. I arranged my squares in what I like to call "Artistic Random." It's not true random, since I arranged and re-arranged until I liked the look of it, but neither is there a pattern. Make sure the squares will cover the entire stocking pattern, with significant extra, to compensate for seam allowances. Sew them together. 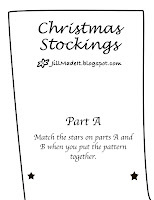 Pin the pattern on your ... stocking top? 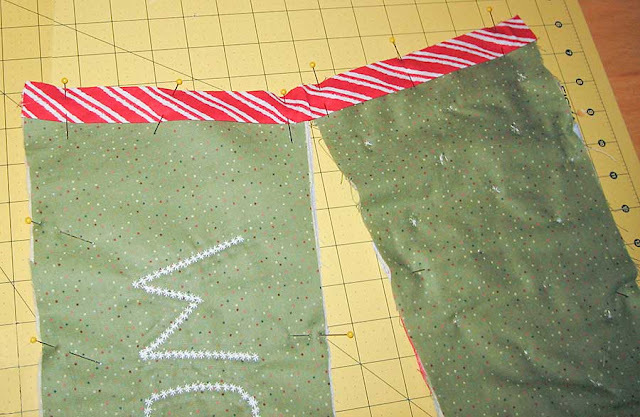 (Like a quilt top...) Cut out the stocking. Sandwich the stocking. The sandwiches go together squares/batting/lining, and lining/batting/backing. Pin the sandwiches together. Be sure to have right sides facing out. 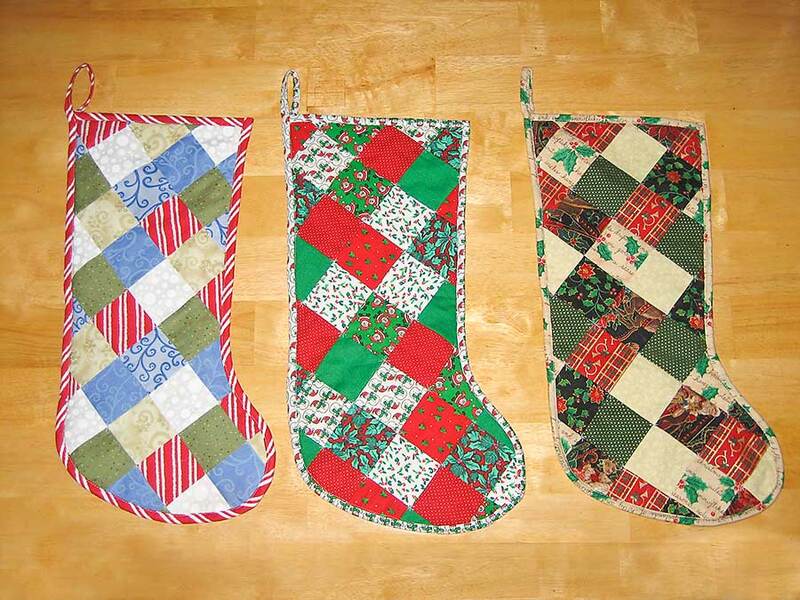 Now we want to quilt the stocking sandwiches. I stitched little snowflakes in each of the corners. It took forever, but was a nice touch, I thought. And I machine quilted each person's name on the back of their stocking. You could tie quilt your stockings (tutorial here), but I would use embroidery floss instead of yarn for this small a project. Or you could machine quilt them. Use whatever method you'd like. Since you don't want to sew the tops closed, you'll bind the tops separately. Bind the tops, but don't worry about finishing the ends--they'll go into the seam allowance when you bind the sides. 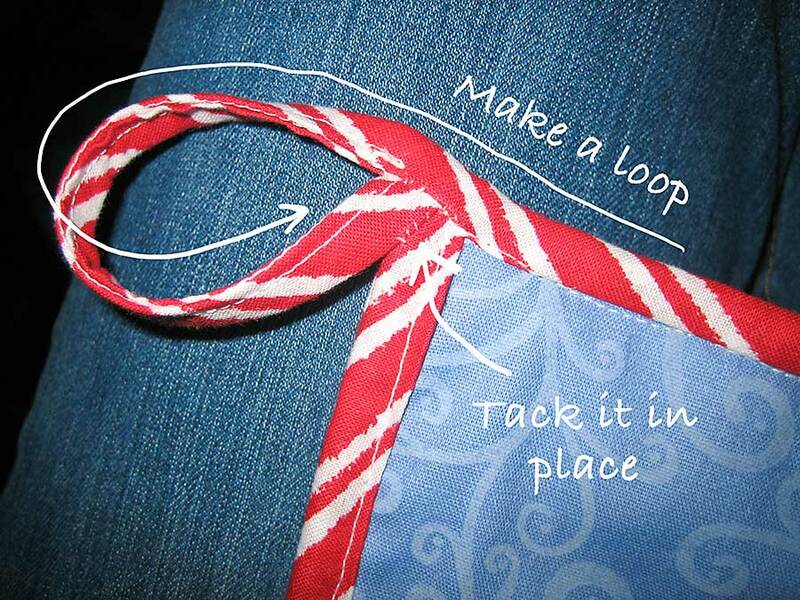 Make a loop with the bias tape, and stitch it into place by hand. They are sized so that they should print nicely on two 8 1/2" x 11" sheets of paper. Tape them together, matching the stars. I love the colors on the blue/candy caned striped one. These are really cute stockings.